The vendor landscape in the global strontium market is marked by the presence of a limited number of companies. Among these, Sakai Chemical Industry Co., Ltd., Solvay, and BassTech International accounted for the dominant share of 60% in the global market in 2015, finds Transparency Market Research (TMR) in a new study. Of these companies, Solvay holds advantage as it is engaged in mining strontium materials. This has made the prevailing competition fiercer. TMR predicts medium to high degree of competition in the global strontium market. Meanwhile, the market exhibits the presence of companies such as KBM Affilips and Yuxiang Magnetic Materials Ind. Co. Ltd. who are not directly engaged in the production of strontium. They are primarily engaged in manufacturing products used in downstream application sectors. “Strategies adopted by these companies have a profound impact on the overall strontium market,” said a lead TMR analyst. TMR pegged the global market at 240.72 kilo ton in 2015. The market is expected to reach 372.09 kilo ton by the end of 2024, reporting a CAGR of 4.91% from 2016 and 2024. Among key application segments, ferrite magnets are likely to hold dominance through the forecast period. 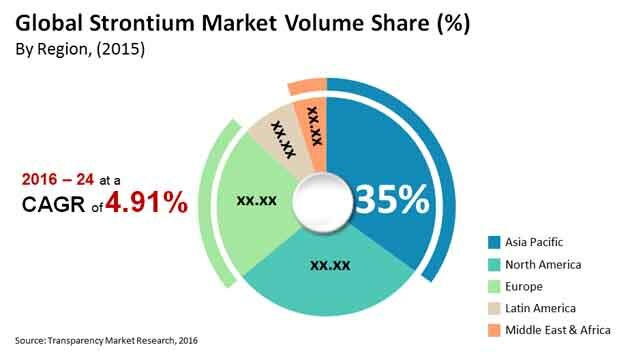 The segment held nearly 32.29% of the global market surpassing other segments including master alloys, zinc refining, paints and coatings, medical, and pyrotechnics. Regionally, Asia Pacific and North America are leading candidates for the top spot. While North America emerged dominant in 2015 with a share of over 29% in the global market, Asia Pacific, as per TMR, is likely to redeem itself. The improving economic conditions across nations has greatly benefited the global strontium market. Economic rebound in developed economies and growth in emerging nations have made industries across the globe more willing to invest in strontium carbonate. Besides this, the market is forecast to benefit from novel applications. In addition to this, the persistently rising use of strontium in traditional areas will bode well for the global strontium market. As per TMR, the increasing use of pyrotechnics in firecrackers, flashpapers, flares, and crackers will boost sales prospects for the market. Firecracker displays during events across various parts of the world will therefore fuel the demand for strontium. On the downside, various countries have implemented stringent regulations to curb pollution. Some of these regulations also inhibit the use of firecrackers. Since strontium is a commonly used compound in firecrackers, regulations imposed to limit their use will have a negative impact on the overall strontium market. Nonetheless, the market is expected to gain from the increasing sales of master alloys in the coming years. The rising use of master alloys in plants where metals and alloys are melt to cast the, into various shapes will therefore boost growth prospects for the market. Master alloys are made of strontium, which offers increased ductility and excellent structure control. Because using master alloys can prove economical than pure metals their demand is expected to surge in the coming years. This will in turn fuel the demand for strontium in the forthcoming years.